Guillermo Amoedo Schultze, the writer/director from Uruguay, is probably most known for penning the screenplays for Eli Roth's The Green Inferno, Knock Knock and Aftershock but he also works alone and his new horror film The Inhabitant (El Habitante) just got a nice international trailer. One night, 3 edgy sisters break into the house of a very important senator to steal money he got from bribes. While doing it, they hear strange cries coming from the basement and decide to go down to investigate. Below, tied to a bed and with signs of having been brutally tortured, the 3 sisters find the paraplegic daughter of the senator begging them to release her; and the girls decide to help her. However, what they do not know is that the girl was not tortured, but is possessed by a powerful darkness that will be responsible for opening the gates of another world. 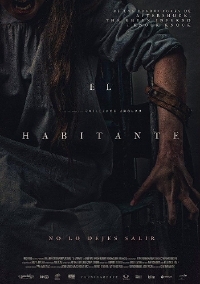 The Inhabitant will open in Mexico cinemas on June 8th, released by Televisa's Videocine.